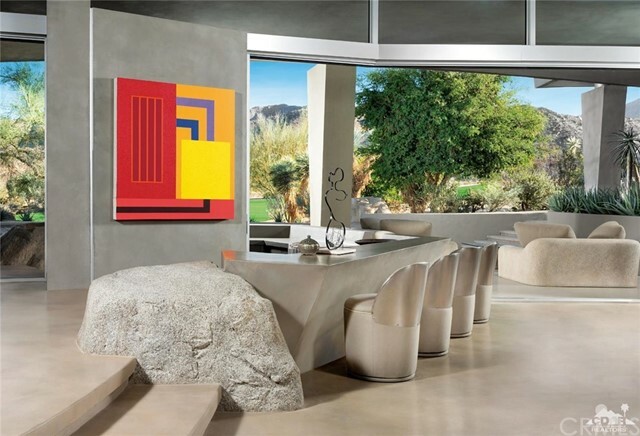 This unique home possesses a tranquility that blends desert inspired textures and organic colors with flowing architectural lines to create a calming desert retreat. Great Room with vaulted ceilings, natural boulders inset in polished concrete floors, multiple seating areas, custom furniture, and cast concrete fireplace that anchors the sweeping sculptural space. Stackable sliding walls of glass bisect the indoor-outdoor, tiered wet bar with custom bar stool seating for eight. Outside, the entertaining patio includes a large pool with artfully designed, ceramic tile waterfall that delivers the tranquil sound of flowing water. Built-in banquette seating and custom furniture lead to a sculptural outdoor fire pit, dining terrace, and integrated bbq center. Desirable south facing exposure overlooks the Canyons Course 13th fairway. This home has been described as a livable piece of art. Must be seen to be appreciated. Inclusions: Home furnished per inventory. I would like more information regarding the property at 519 Mesquite Hills, Palm Desert CA 92260 - (MLS #2804658). Listing #218033254DA By Jacquie Burns, CalBRE#01185587, Bighorn Properties, Inc.